The flavors, once melded together, become the perfect compliment to each other. 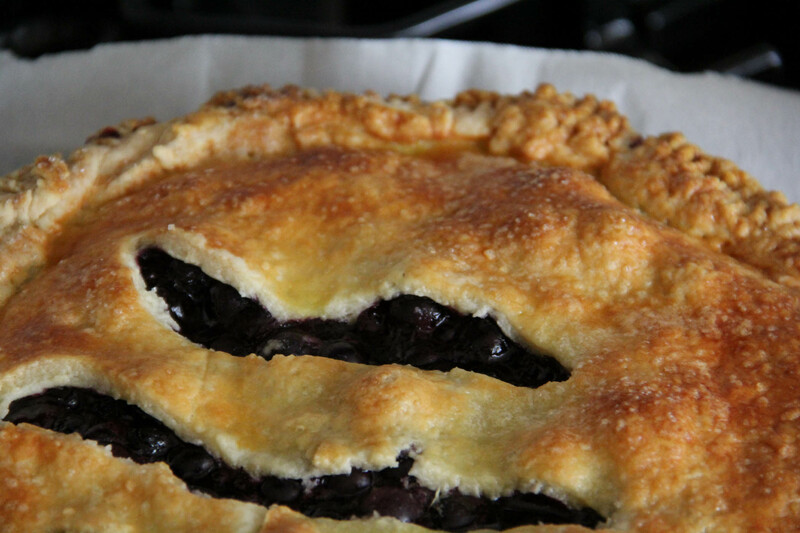 I have a great recipe for a traditional blueberry pie which calls for fresh lemon juice. This recipe uses fresh lime juice which when mixed in a bowl with blueberries, freshly grated ginger and lime zest smells absolutely amazing. Even though this recipe requires a fair amount of time (the dough has to rest and come together in the fridge) then assembly, baking time and finally a four hour cooling time, it’s worth it and actually really easy. Perfect for a lazy Sunday summer afternoon. In a large bowl combine flour, sugar and salt. Set aside. Cut cold butter into 1″ pieces. It sounds large I know but Bon Appétit was adamant about it. Add your butter, and with your fingers and palms work butter into smaller, irregular pieces. People, I’m not going to lie. This is where I literally felt like I had arthritis in my hands! It’s hard work!!! The key is to keep some pieces pressed flat and others larger and chunkier. Combine vinegar and ice water in a cup. Drizzle mixture over the dough and distribute with your hands until dough starts to hold together. Turn the dough onto a floured work surface (no extra flour needed) and form into a round ball. Cut in half and press each half into a 1″ high round disc. Wrap each half in plastic wrap and throw in the fridge for at least an hour. The dough will freeze for up to one month. 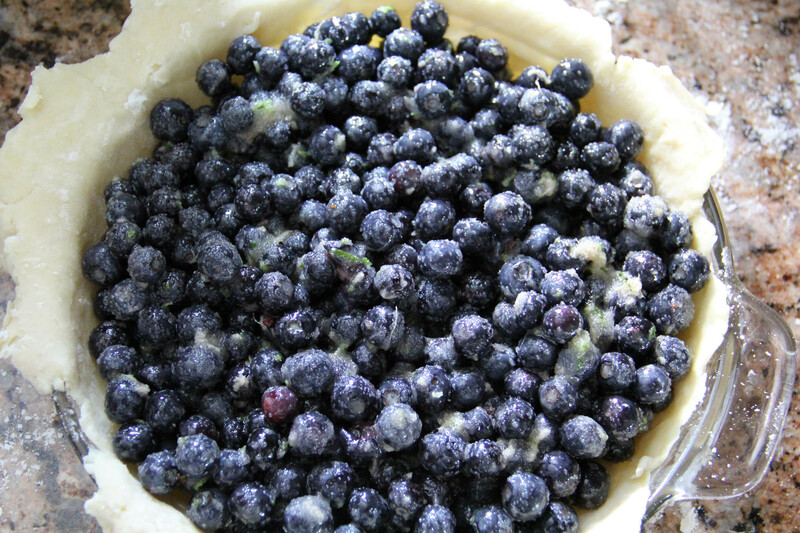 Once dough has chilled you can begin assembling your pie. Preheat oven to 350. In a large bowl mix together blueberries, sugar, cornstarch and fresh lime juice. Give it a stir. Add grated ginger and lime zest and stir some more to fully incorporate all the filling ingredients. Yum, the smell alone is enough to make me want to start eating raw blueberries covered in a ginger lime syrup. Roll one disc of dough onto a lightly floured surface to a 13″ round (1/4″ thick). Transfer round to pie dish, push to edges of pie pan and allow edges to fall over the side of the pan. Keep other disc in fridge until ready to put on the top of the pie. 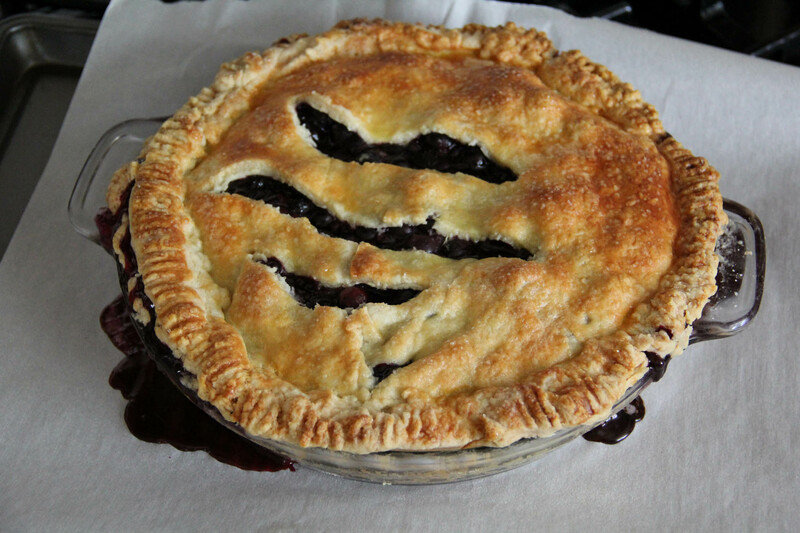 Pour in the blueberry filling. Pull out remaining dough from fridge and roll onto a lightly floured service into another 13″ round. 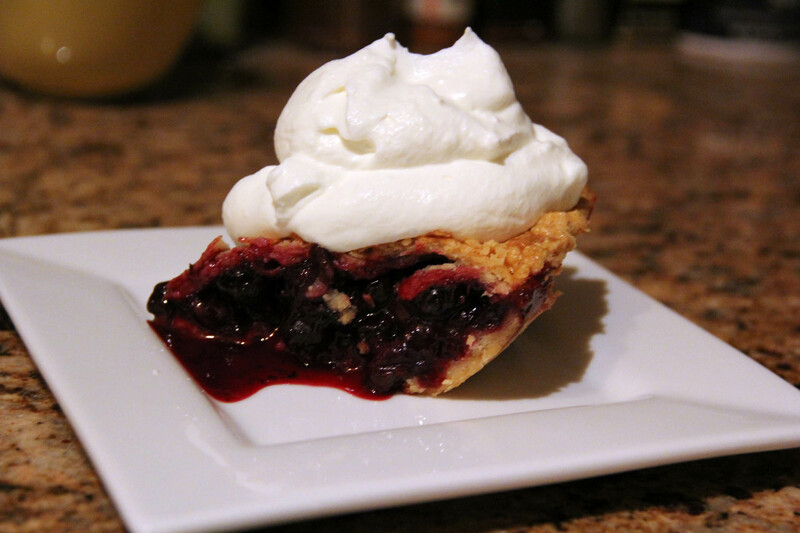 Drape over your filled pie. 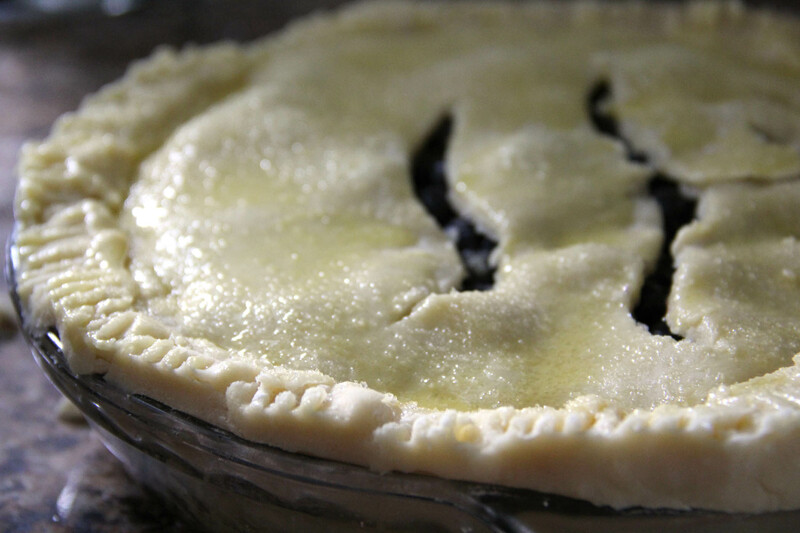 Be sure to add some slits in the top of the pie to allow steam to escape. Seal the dough with a classic pinch crimp, rustic fold over or simple fork crimp. Do NOT worry about being perfect here. Whatever works to keep everything sealed up. I actually like more rustic looking pies so my edges were in no way perfect, but it still looked tasty! 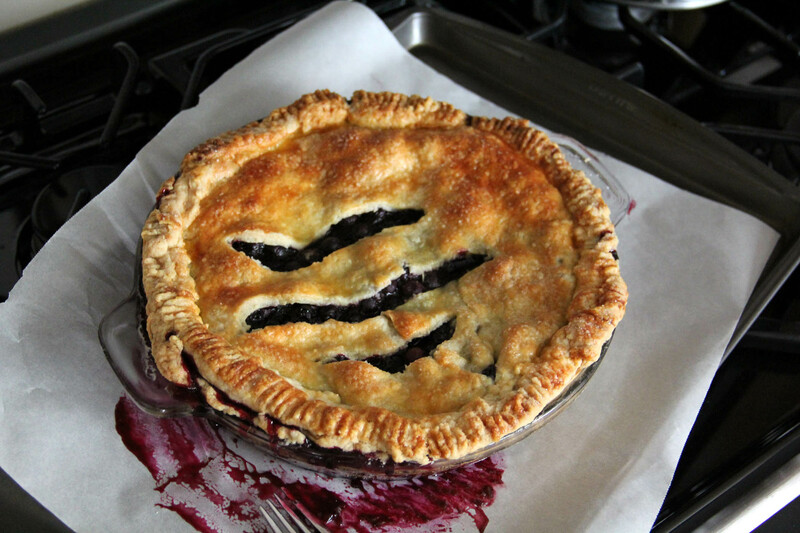 Beat 1 large egg with 1 tsp water and brush egg wash over the top of the pie. Sprinkle with 2 tbsp. granulated or turbinado sugar which will give you that sparkly, crackly texture on top. 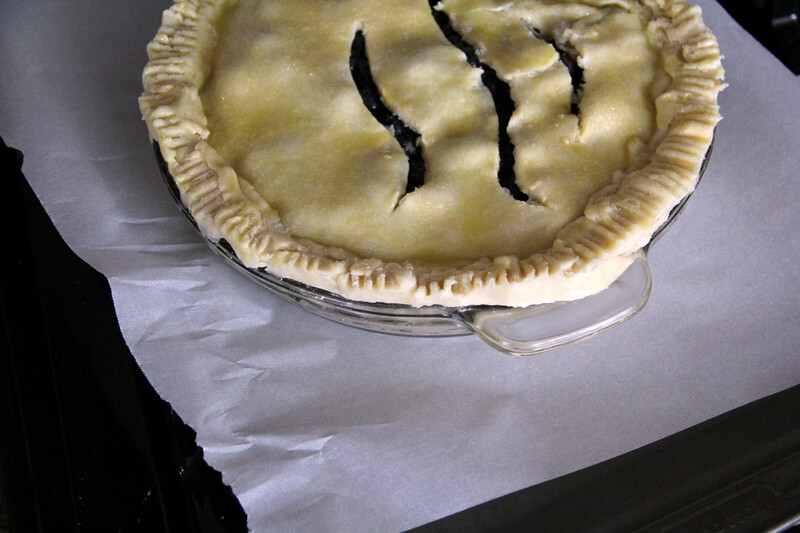 Place pie on a foil or parchment lined baking dish to catch any juices that run over. Bake until crust is deep golden brown on top and bottom and juices are bubbling, about 1 ½ hours. The next step is pretty important. 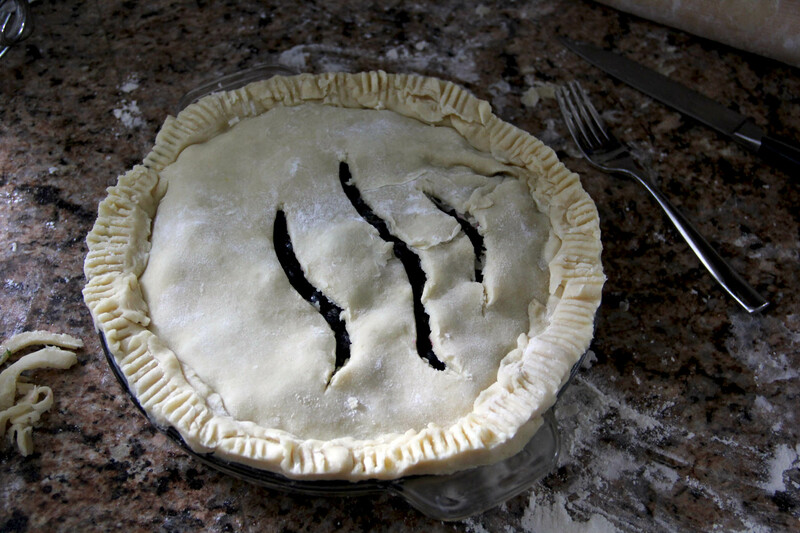 The pie really must rest for about four hours to firm up. Look how pretty it looks. Try not to steal a bite while it cools. We ate this with homemade whipped cream and it was pure summertime heaven.